It is not everyday that a cruise liner is booked for a wedding. Sana Adel’s wedding is something to look forward for its fully charted amazing cruise wedding. Designers like Neeta Lulla, Rohit Bal, Vavchi, Dhruv Sehgal and Anjali K will be a part of the Sana Adels’s wedding. The cuisine on offer will be exceptional, there will be over 75 chefs on board the cruise. Chef Mir Zafar Ali will also be accompanying the team to prepare special ‘mumbaiyya’ dishes for the wedding. The Sana Adel Wedding hosts a list of B-Town Celebrtities that will add the glamour to the four day cruise wedding amidst the Mediteraanean Sea. The list includes everyone. Former Miss India’s Sushmita Sen and Juhi Chawla wil be attending the wedding. In addition, Malaika Arora, Shilpa Shetty Kundra and Shamita Shetty, Gauahar Khan, Karishma Tanna, Gurmeet Choudhary and Husain and Tina Kuwajerweala will be present. Famous Rapper and singer Badshah and Meet Bros will also be performing at the wedding among other artists. 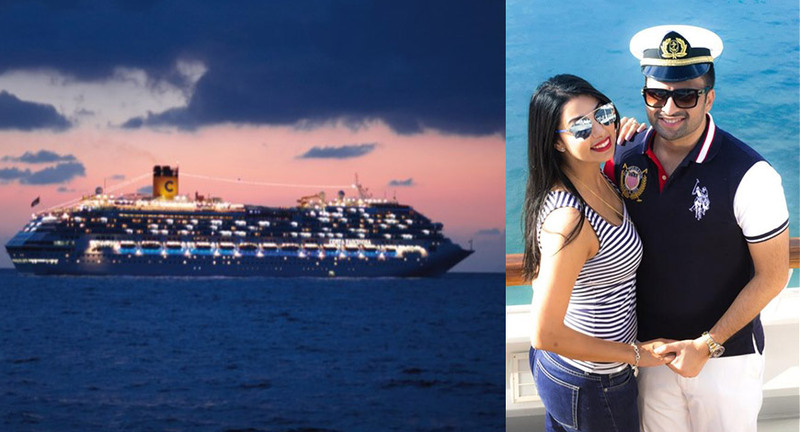 The exciting part of the Sana Adel’s wedding is that it is happening in Italy on the Coasta Cruise. The wedding is a four day affair with loads of excitements and luxuries.